The expression of a single gene can directly convert heart muscle cells to cardiac pacemaker cells (i.e. SAN cells) both in an animal and a dish. 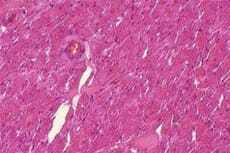 An advantage over stem cell-derived pacemaker cells, the direct reprogramming method as outlined in a new Nature Biotechnology study eliminates risk of tumor growth. The Cedars-Sinai Heart Institute scientists led by Hee Cheol Cho, PhD, hope, in going forward with this research, that these cells could replace electronic pacemakers for patients with cardiovascular damage or disease.